Judson has been ranked a 2018 Best School by Niche, a national school search website. 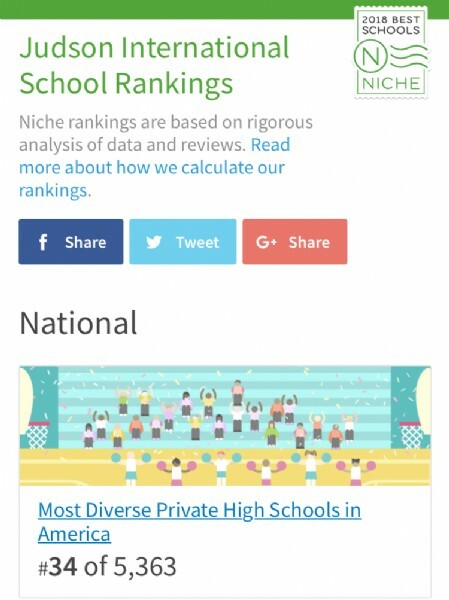 Judson was recently selected as a Niche 2018 Best School and given a #34 ranking for the Most Diverse Private High School in America out of 5,363 high schools. Judson was also ranked as #7 Most Diverse Private High School in Los Angeles County out of 149 schools. We are honored to receive this recognition which fits so well with our mission to partner with parents to educate children who will grow in knowledge, understanding, and wisdom to become leaders in God's Kingdom and today's world. 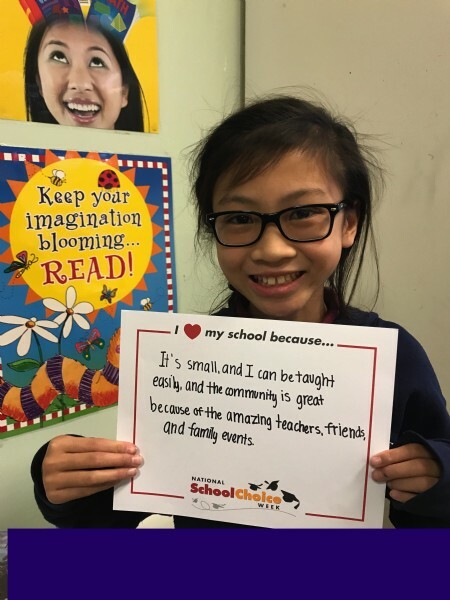 What makes Judson School unique? We are a K-12 Christian school with a global focus. Our student body is 30% international from 20 different countries. Our faculty have lived and worked overseas. 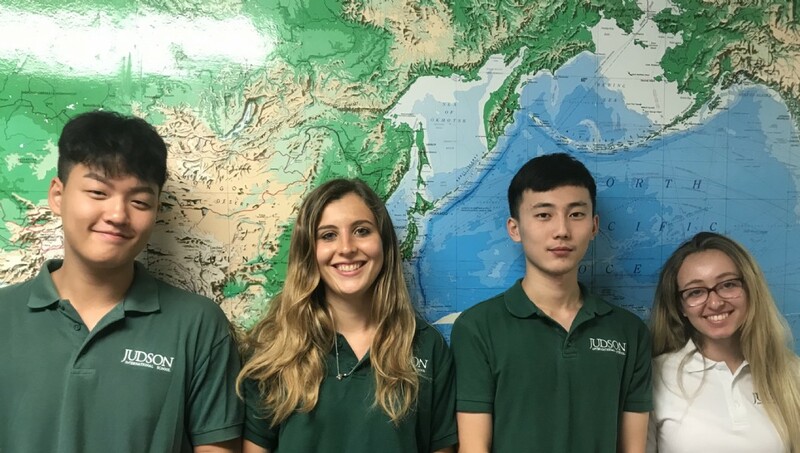 The International Christian Curriculum developed for our school integrates world history across disciplines and teaches children from the earliest age about understanding the world through research and investigation. 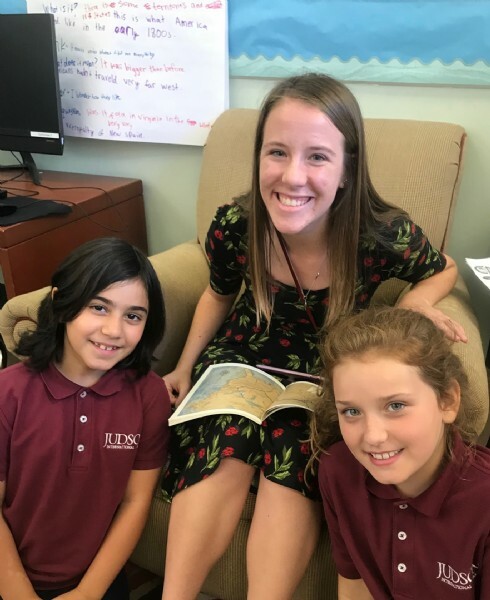 Judson students engage in investigative learning through research, writing, projects, experiments, "real books," frequent field trips and opportunities to serve others. Judson students form lasting friendships across cultures and the most common comment visitors make is "Your students are so happy!" Our annual Judson Gala held on May 12 was well-attended and a big success. 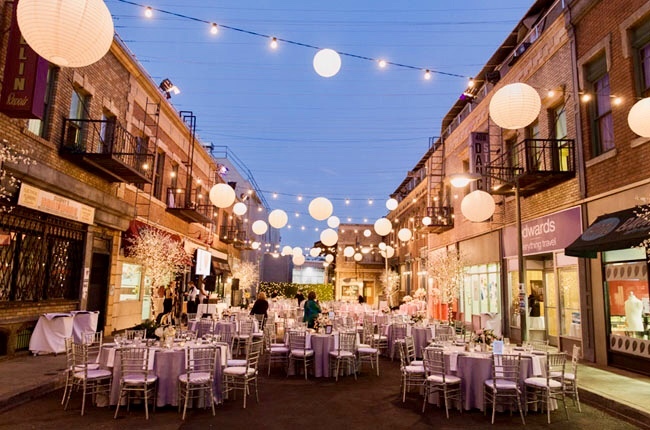 Judson International School recently hosted its annual gala at CBS Studios. 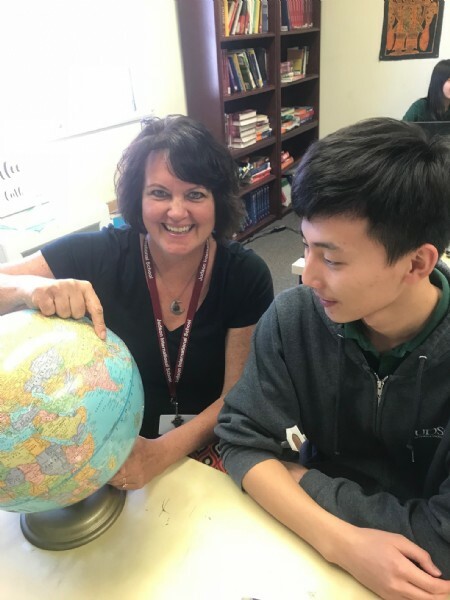 This year's theme "Judson - A Part of History" was inspired by the school's International Christian Curriculum that integrates world history at all levels of learning. Over 140 people attended the event which took place at the New York Street outdoor filming location which has been used in numerous popular shows such as Brooklyn Nine-Nine. The evening, chaired by Jelayne Haight and Christie Thomas, featured a silent auction, a live auctioneer, and comedian Ron McGehee. This year's gala honoree was Dr. Jim Belcher, president of Providence Christian College, who donated copies of his new book In Search of Deep Faith to all attendees. Judson International School exceeded the fundraising goal for this gala; the money will go towards student scholarships and school programs. Come join us for a magical night at CBS studio center where some of your favorite shows like The Voice, America's Got Talent, Brooklyn Nine 9, The Adams Family, Gilligan Island were filmed. We are very excited about our upcoming Spring Gala entitled "Judson- A Part of His Story". As part of the Judson community and story we want you to be there. We are thrilled to be hosting this event at the CBS Studios Radford in Studio City on the iconic New York Street backlot set where filming happens for authentic looking New York scenes. Our goals for the May 12th event include raising money to support scholarships and school programs. We want to see the Judson community come together for a fun and entertaining evening as we laugh, enjoy delicious food, and hear from our honoree, Dr. Jim Belcher. We hope that those outside our immediate Judson community will come, also, and see how Judson International School has always been a part of God's ongoing story to the world as it educates and nurtures students in a unique way in the San Gabriel Valley. Our evening together will consist of a silent auction, delicious dinner, entertainment by Ron McGeehee who has been called the world's funniest "Half Korean, Half Irish" comedian. He's preformed all over network television, from Last Comic Standing, Comedy Central, TBN and Daystar. Ron is a Christian comedian who will keep you laughing with his clean comedy. We'll honor Dr. Jim Belcher, president of Providence Christian College, and hear him speak about his book In Search of Deep Faith. Our live auctioneer from last year will be back to help raise the needed funds for Judson's generous scholarship program and other school needs. To top off a memorable evening we'll open up the dance floor and celebrate the unique and wonderful community that we are. Little Mermaid Makes a Big Splash! Judson School's production of Little Mermaid delighted sold-out crowds this past weekend. Nothing delights audiences more than a fun, familiar, feel-good musical like The Little Mermaid. March 23 and 24, Judson International School presented this Disney musical at Porticos Theater, directed by Maren Plog. Judson's show had a cast of twenty-one students ranging from 6th to 12th grade. All show played to sold-out crowds. Director Maren Plog said of the show, "Ariel's story can remind us the forgiveness, redemption, and good triumphing over evil are possible." This show was Judson's fourth musical and part of a very successful musical theater. 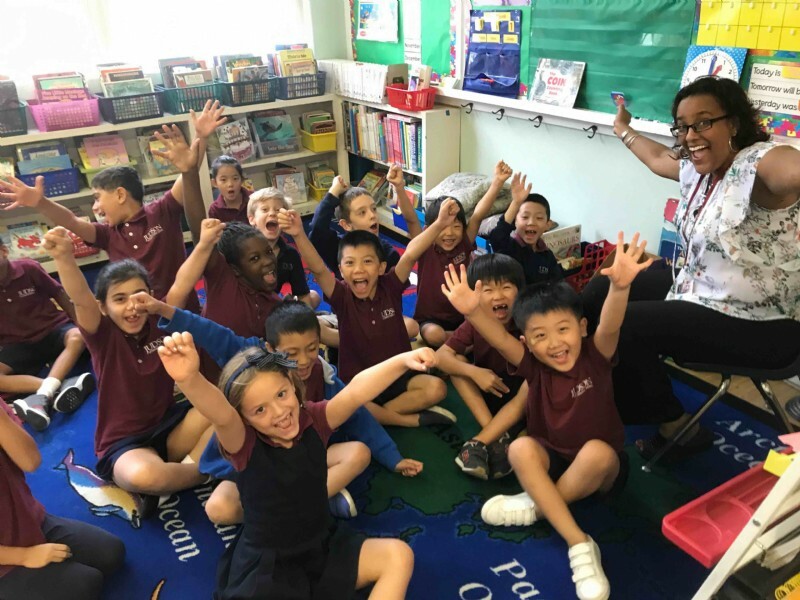 Principal Diana Bjoraker commented, "This show is a fine example of the excellent quality and breadth of education offered by Judson International School." Did you miss last week's State of the School address? Here are the highlights from the address. · We are providing an excellent education, valuing spiritual formation and character development. 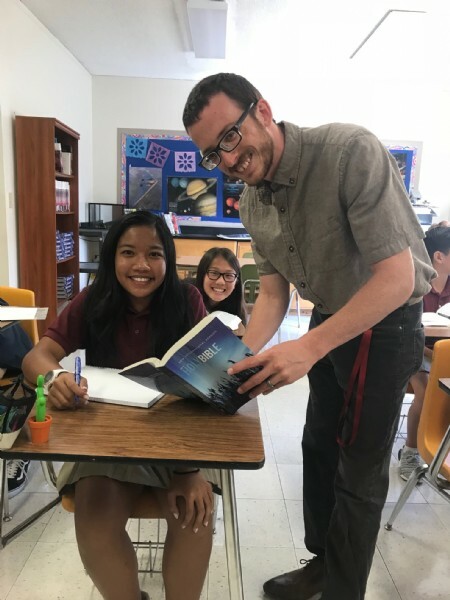 · All the Judson faculty and staff are devoted to what they do, love your children, are committed to a relationship with Jesus and appreciate the family type of community that has been created. 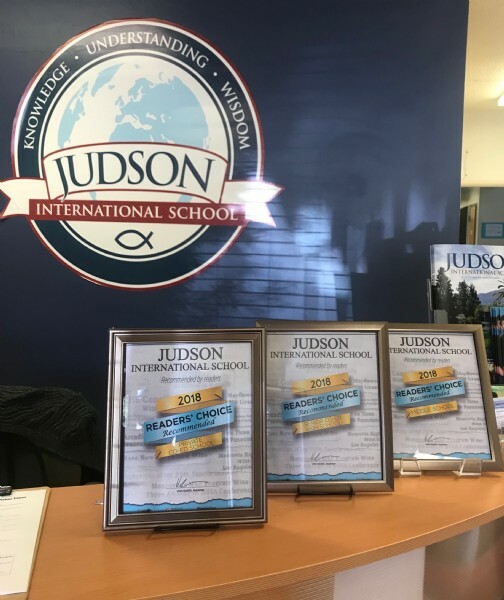 Judson International School is thriving and is positioning itself to be around for another 25 years. · We have had an increase in enrollment of 65 students since May. · We have more than doubled the size of our Kindergarten class since August. · Enrollment for 2018-19 has begun. Please respond to the 2018-19 registrations email you received. · We have implemented successful budget strategies which have paid off and we will be on the positive side of the ledger at the end of this academic year. · As of January 12, 2018 Judson is now its own 501 (c) 3 corporation. This independence allows us to better shape the direction of our school. 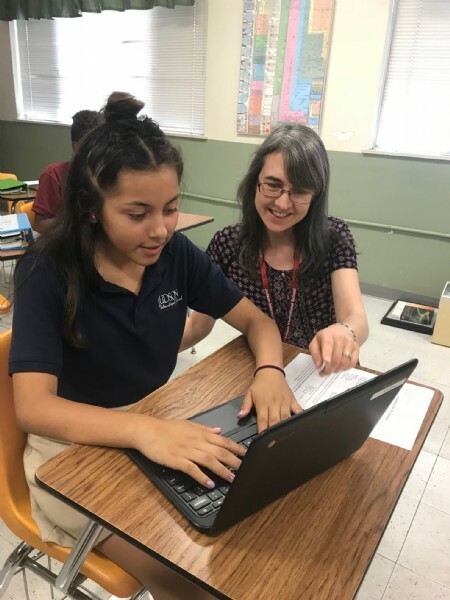 · This positive financial trend will enable Judson to make decisions that will benefit the school such as hiring credentialed science teachers and bringing other programs such as music, language and computer. 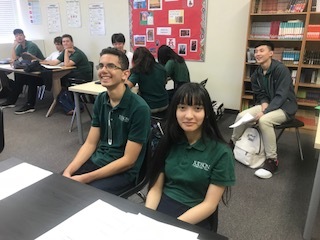 · We are pursuing A-G approval for high school courses to meet University of California/California State admissions requirements. · We added a photography elective this semester and are planning to increase the number and variety of electives offered. · We are planning to hire a part-time college counselor for our high school. · We had a year-end fundraising campaign. The goal for the year-end campaign was to raise $10,000 and we exceeded our goal and raised $13,000. Thanks to many of you that made contributions. · We are moving ahead with planning for our second Gala fundraising event. Last year's event was very encouraging and we are looking forward to a great celebration this year. Mark your calendars for May 12th. You will be getting more details soon from our Gala committee: Erika Walton, Jelayne Haight and Christie Thomas. · Judson is in need of a strong philanthropy program. The year-end giving programs along with the Gala and other fundraising efforts will move us towards achieving the ultimate goal of a $100,000 annual fund. · Judson has a lease for this campus through the 2018/2019 academic year. Being on this campus beyond that will be determined by the buyer once a sale is finalized. 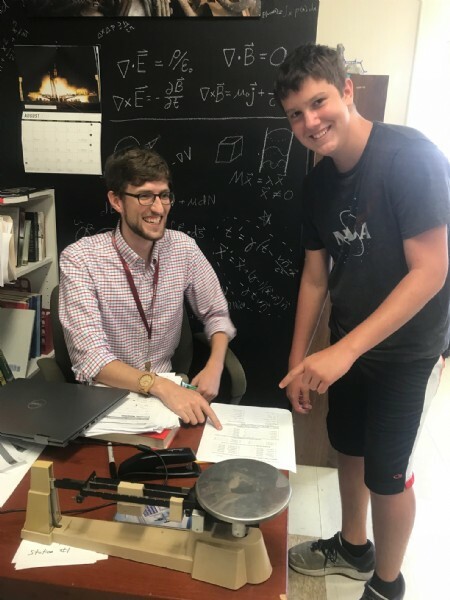 · Judson's desire is to stay on this campus, establishing a long term lease arrangement and then beginning a capital campaign to fund the remodeling which will upgrade and enhance our school facilities and provide a high level of security. Our plan is to remodel Carmichael and Zwemer, and also to build a new multipurpose indoor facility. · Judson will be also be looking at other campus options. PUSD is making $15 million cuts from its budget and will be looking for renters of their open campuses. 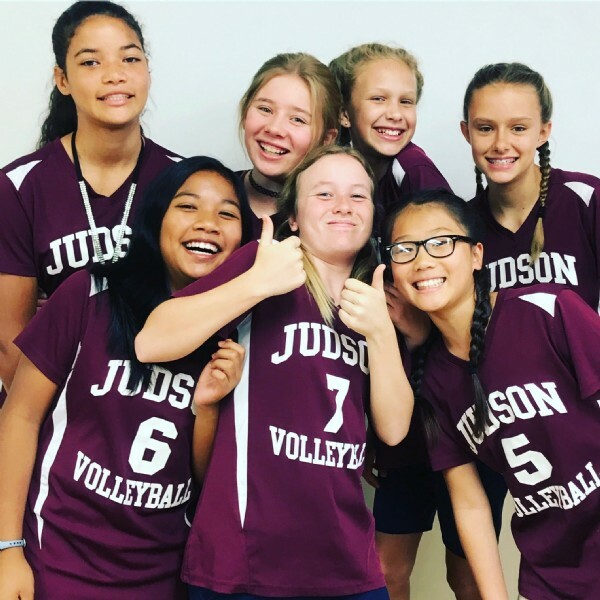 · While there is uncertainty about location of Judson beyond the 2018-2019 academic year, there is absolutely no uncertainty about the existence of Judson school for the next 25 years. We are strategically planning, operating and building our future now. Our Science Night was a big success. Students at all grade levels displayed their science projects to family, friends, and guests. Judson Science Night was an opportunity for our students to show what one of the best Christian schools in Pasadena is focusing on for STEM. All students, grades K-12, displayed their projects for families, friends, and guests. As always, we welcomed alumni who came back to see their alma mater for this fun night. Projects were creative and interesting. The kindergartners gave guests an opportunity to stick their hands in "blubber" to see how it protected them from cold. First and second graders wrote, directed, produced and acted in their own movie entitled Spiderific which is all about spiders. Third and fourth graders created aquatic creatures which floated down from their classroom ceiling. Fifth and sixth graders, dressed as doctors, presented a journey through the human body. Our junior high students presented their science research projects on a variety of topics from augmented and virtual reality to quantum computing to fracking. High school biology students demonstrated worm dissection, DNA testing, and blood typing. 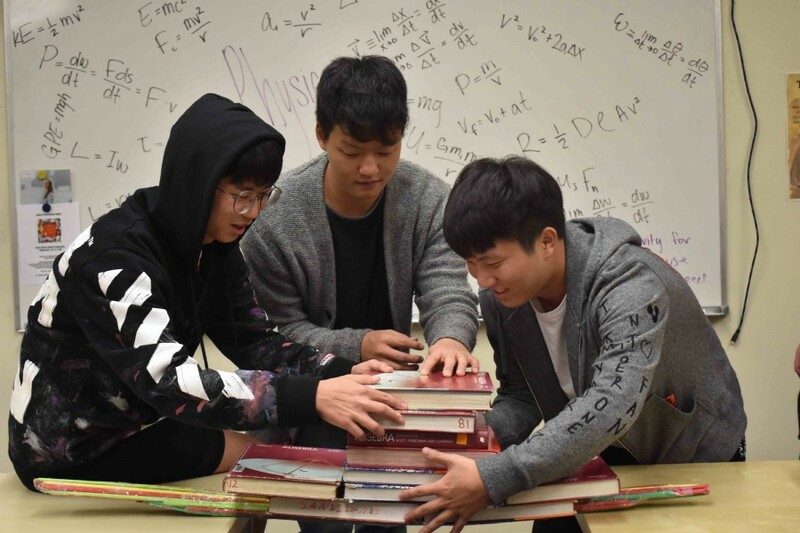 High school physics students had to make bridges using only paper that would hold a hardback textbook. The record bridge held 17 textbooks. The creativity and love for learning that Judson is known for were evident in abundance in their STEM projects on Science Night. February 15 is a big night at Judson School! At 6 pm we will have our annual State of the School address for Judson families and an Admissions Meeting for prospective families. At 7 pm is our Science Night for everyone. 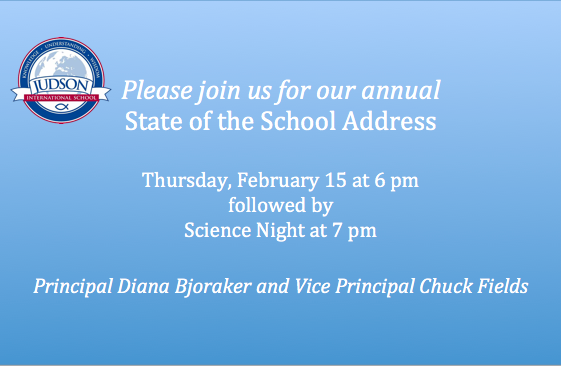 Judson Families are all invited to join us for our annual State of the School address. This is a chance to hear from principal Diana Bjoarker and Vice Principal Chuck Field about Judson's goals and objective and our progress on our Five Year Plan. Please plan on joining us. This event will be followed by Science Night at 7 pm at which all our K-12 classrooms will be open and students will be displaying their science projects. Feel free to visit any classroom you wish. 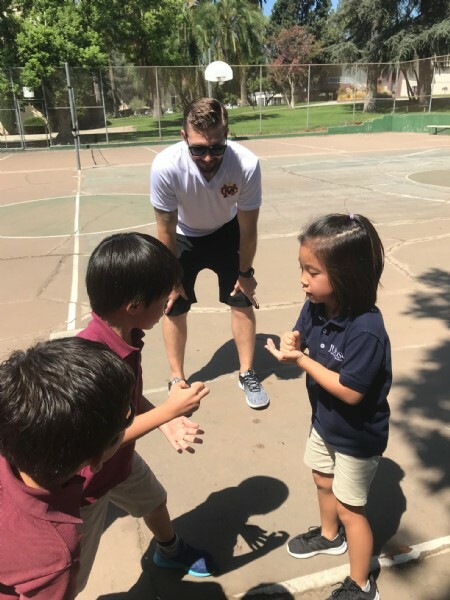 It's a great time to see what's happening around our school. 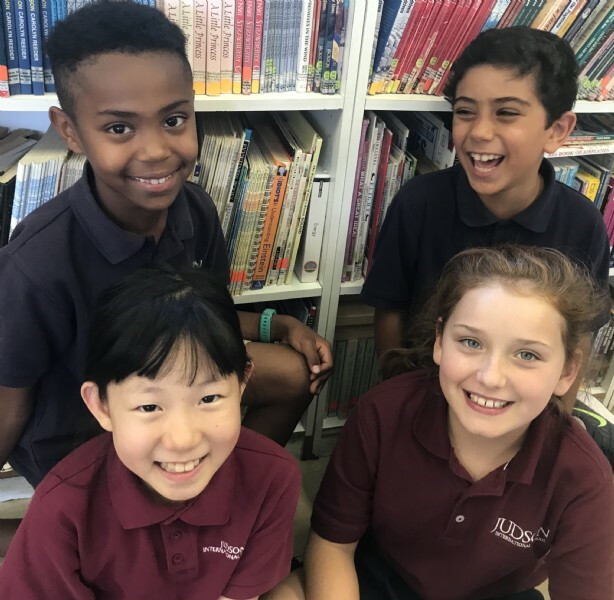 Prospective Families are invited to join us at 6 pm for a meeting with Admissions Director, Kim Aasland, who will give an overview of our school and explain the admissions. Please invite interested friends to join us. 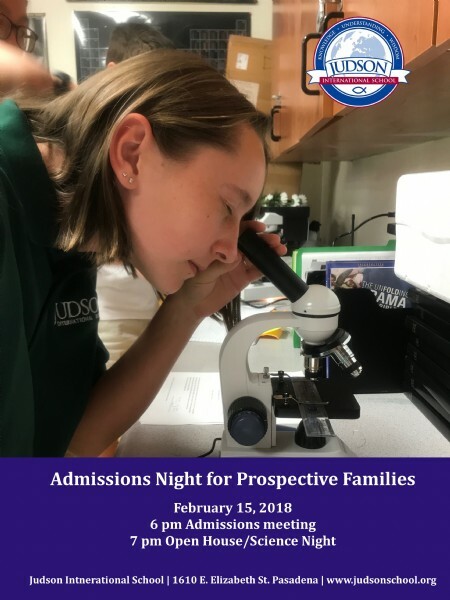 Prospective families are encouraged to stay for Science Night to visit classrooms and meet our Judson community.